Play and control RD4 - Groovebox with the Launchkey Mini from Novation. Play notes, turn knobs, set drum steps and operate the mixer! The Launchkey Mini is a compact MIDI keyboard and controller featuring a 25-note keyboard, 16 velocity sensitive, three color illuminated launch pads and eight rotary controls. 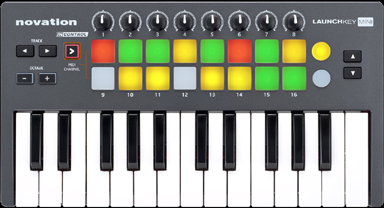 The RD4 - Groovebox can be controlled extensively with the Launchkey. Play and record notes with the keyboard, control filter with the knobs, enter drum steps with the pads and switch between the different instruments of the RD4. The interaction of the Launchkey and RD4 is bidirectional so that the pads will be illuminated to show steps, notes and settings with three different colors. For a reference of all implemented functions get the RD4 Launchkey Mini Implementation Chart. To connect the Launchkey Mini device to your iPhone or iPad an MD821ZM/A Lightning to USB adapter is needed (iPhone 5 and later). These adapters convert the connector of the iPhone or iPad to a standard USB port. 1.) Your Android device should run at least Android 4.1. 3.) To connect any USB device to an USB host compliant device an USB Female to Micro USB Male On-The-Go Cable Adapter is needed. They usually cost below $5.